Flowering: Blooming Growth Rate: Moderate growth rate Light requirements: Full Sun, Partial Sun and shade Plant Group: Tree Plant Type: Deciduous Plant Zone: Zone 5, Zone 6, Zone 7, Zone 8, Zone 9 Size at Maturity: 20 - 30 ft Size at time of shipping: 2 year old plants, 1-2' at time of shipping, ships bare root. Cercis canadensis 'Alba' - White Flowering Red Bud - Be the first in your neighborhood to have this white flowering specimen. Very unusual. This is sure to be the talk of the neighborhood but also a delight to its owner's eyes for years to come. An unusual and delightful addition to any garden or landscape. When you want something showy, that requires little care, and grows into a beautiful specimen; this is the tree for you. 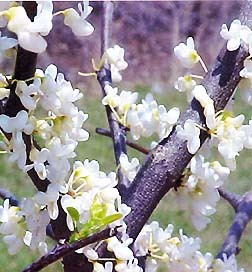 The 'Alba' White flowering Red Bud is a moderate grower to 20 foot tall with a fifteen foot spread. It blooms in early spring, likes sun or partial sun, and a well-drained soil. It displays a yellow-orange fall color.